Generally both PU Adhesives and contact adhesives should not be used if the temperature is below 5° C, they should also be stored at 15+°C. Storing the adhesives on the roof overnight during low temperatures is considered poor practice and should be avoided. 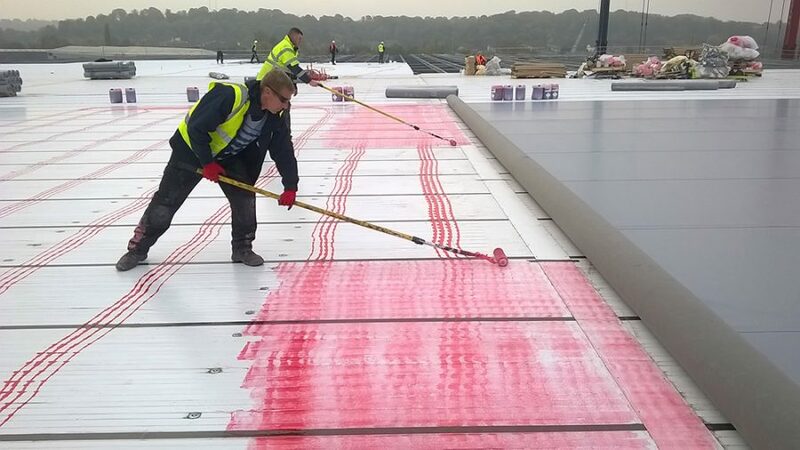 If this is unavoidable then provision should be made to store the adhesives off the roof or deck surface and forming an enclosure using insulation boards and membrane or Polythene sheet to keep the insulation dry. During working periods a heat gun set on a lower or moderate temperature can be used to raise the air temperature within the enclosure. The gun should not be aimed directly at any of the products and should, be hand held and monitored at all times. The adhesives can be temporarily placed in a water filled “bitumen boiler” kept at a moderate temperature and monitored; the water should not be heated too high. A suitable risk assessment must be made if adopting such a practice. This however is dependent on each contract allowing the use of a portable gas based system on site. If allowed to use a gas torch, certain substrates (Existing roofing or cementitious surfaces) can be warmed with the flame prior to applying the adhesive. Naked flame burners should not be played on or near any combustible surface. Under no circumstances should any adhesive be warmed directly with a naked flame. IKO Systems S-A VCL and Underlay should not be used if the temperature is below 5⁰C. A sufficient quantity of the material should be stored in an environment with an ambient temperature between 10⁰C and 20⁰C for at least 24 hours prior to use. This will ensure the desired performance is achieved i.e. good flexibility and membrane adhesion. IKO Systems S-A Vapour Control Layer has a 75mm wide self-adhesive selvedge protected with a strip of release film (zipstrip) to facilitate the bonding of the side lap. All side (75mm) and end laps (100mm) must be fully bonded by hot air welding to exude a bead of bitumen from the joint. The use of torches to provide heat activation to any laps is not an acceptable method of application for any self-adhesive product. As long as the laps are prepared, cleaned and dried in accordance with our recommendations and the equipment is set up correctly lower temperatures shouldn’t prevent a weld being achieved, we would always recommend that test welds are carried out as a matter of course. Pre-warming the lap joints may prove beneficial. Rock salt crystals must not be used as a surface de-icer; if walked on they could be forced into/through the membrane thus causing damage to the waterproofing integrity of the single ply roofing membranes. Soft salts and powder based de-icers can be used and should not prove detrimental to either TPE or PVC based membranes.